Danielle’s plans for the future were pretty easy to figure out… until she failed senior English and her single college application was denied. Suddenly she’s in hot water with very few options, because honestly who applies to a safety school when their mom is a semi-famous “college psychic”?! Determined to get her life back on track, Danielle enrolls in her hometown community college with a plan: pass her English class and get back into Ohio State and her mother’s good graces. Romance isn’t on her radar…until she reconnects with her childhood crush and golden-boy-next-door, Luke. Between family drama, first love and finding her own way, Danielle can’t help but feel a little overwhelmed. Thankfully she has her friendship with the snarky and frustratingly attractive Porter, her coworker at the campus bookstore, to push her to experience new things and help keep her afloat. One thing’s for sure: This time, failure’s not an option. 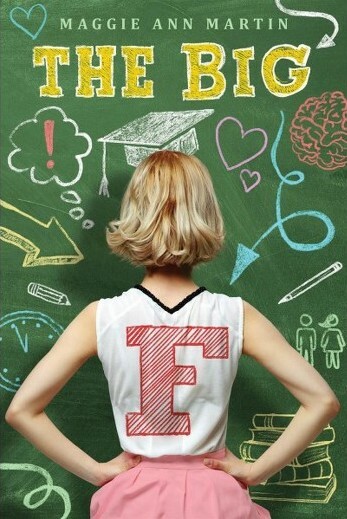 The Big F is Maggie Ann Martin’s debut novel with Swoon Reads. I love this imprint, and The Big F was not a disappointment! I was expecting something different, but I ended up being pleasantly surprised by this story. Danielle messed up big time. She was all set to attend Ohio State until she failed her high school AP Lit class. Instead of letting her mother, the college psychic, know and use her connections to get Danielle reaccepted, she keeps it a secret well into summer. When her debacle is revealed, she must earn her parents’ trust back. Luckily, Danielle has a plan. She’s going to enroll at the local community college, take a literature class that will make up for her failed class, and get a job. What she wasn’t planning on was reconnecting with her old neighbor and childhood crush, Luke. I really enjoyed being inside Danielle’s head. I thought she was a well-developed character and I loved watching her learn to own her mistakes and take on the responsibility to fix them herself. It was great seeing her figure out her passion and how that differed from her mother’s plan. I also appreciated the friendship Danielle had with her best friend, Zoe. It really did feel like they were best friends who hung out with each other on a regular basis and supported each other. I would’ve liked to seen more about Zoe, though! I have questions about her background, and I hope Maggie plans to write her story one day. What I was not expecting was for this book to turn into a love triangle. I guessed I assumed from the synopsis that Danielle was going to flirt and work towards a relationship with Luke. However, they started dating within the first couple of chapters. I liked that this wasn’t drawn out, but I felt like we didn’t really get to know him at all. We were introduced to Porter, Danielle’s coworker and Luke’s roommate, and really got to know him well. I really loved the friendship that developed between the two of them and how Porter encouraged Danielle to follow her passions. Overall, The Big F surprised me in the best way possible and I ended up really enjoying it. Maggie Ann Martin hails from Des Moines, Iowa but moonlights as a New Yorker. She has a shiny new BA in English and Journalism from the University of Iowa, the most welcoming literary community in the world. When she is not writing, you can find her binge watching TV shows or passionately fangirling over fictional characters on the Internet. The Big F is her debut novel. Great review! This sounds like a well written read and right up my alley as well! I like Swoon Reads too but I hadn’t heard of this one. Sounds cute! It just released today so hopefully you’ll see it around bookstores now!